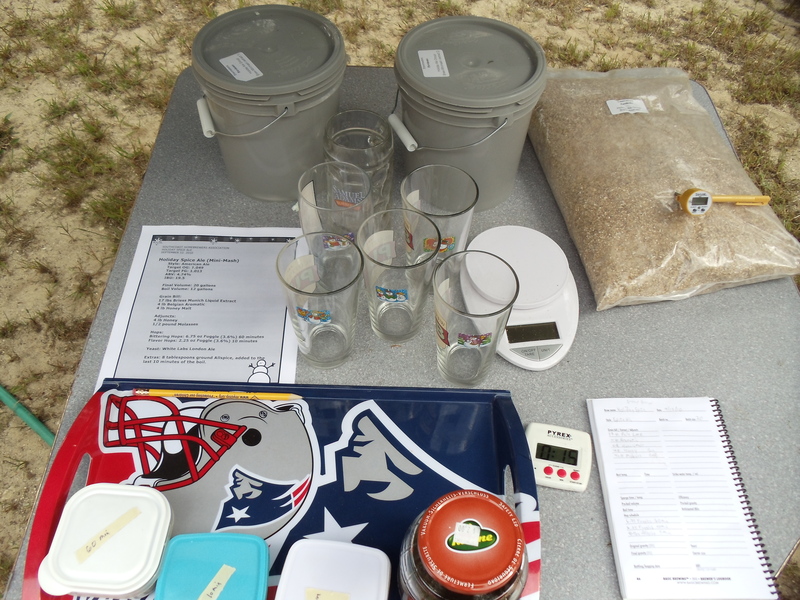 I’ve been doing all grain using the Brew In A Bag (BIAB) method for about 18 months now and thought it may be good to put my methods down in writing for posterity and perhaps help others. Yesterday I did an OktoberFAST batch and took careful notes, so here goes. 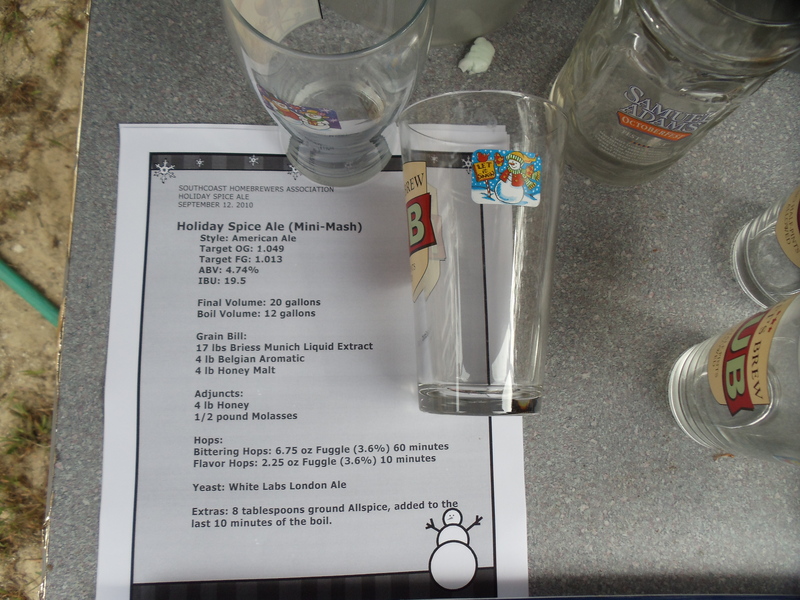 I got my stuff from Brewmaster’s Warehouse and saved the recipe here: OktoberFAST in case you want to try it. I first want to get a total water volume required. I know from my past calculations that my grain will absorb about 0.5 gallons per pound of malt so that’s 11.5 X .05 = 0.575 gallons. My batch size is 5.25 gallons. My boiloff rate is 2 gallon per hour so 2 X 1.5 = 3 gallons. Total water needed = 0.575 + 5.25 + 3 = 8.825. I’ll measure 8.8 inches in my pot since 1″=1 gallon for my pot. 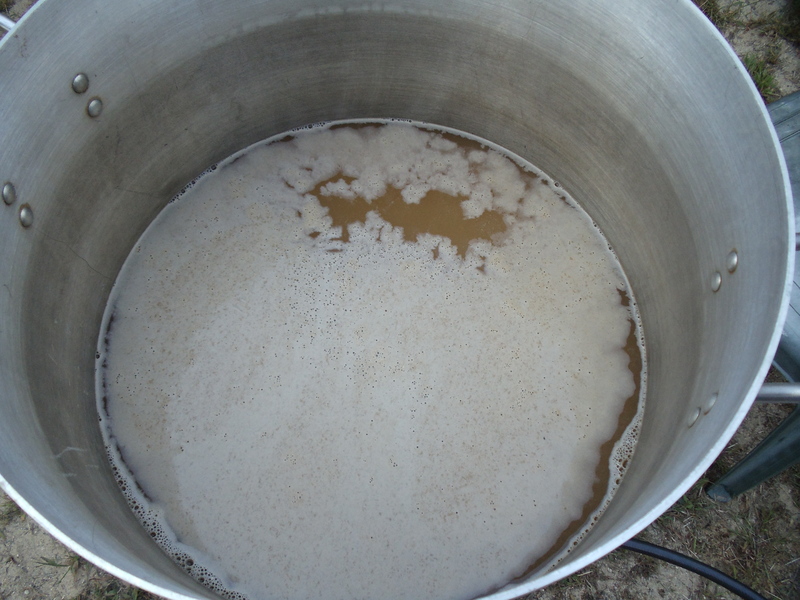 All of the water in the mash would give me 3 qts/# thickness, I can thicken this up a bit by doing a mash out sparge. I have found it makes things easier and gives me better efficiency when I do this so I normally do. 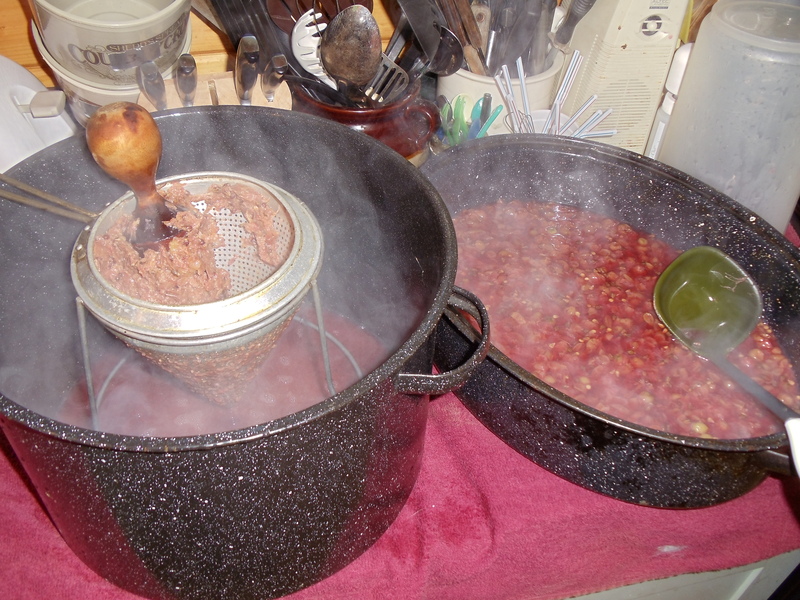 I will save 2 gallons for a mash out so I put 6.8 inches of water in my pot and begin heating. Yeah, my water is pretty void of minerals. I find it hard to adjust to a certain profile so I usually just adjust to meed the SRM then check the chloride to sulfate ratio to fit the malty/bitter profile for the beer I am brewing. I take the temperature of my grain and find out I need 162.5F for the 6.8 gallons of water plus grains to hit 156F mash temperature. I’m not critical on this step for this beer because it is just important to be above 152F. Once I hit mash temperature, I dissolve the salts in a smaller bucket of the mash water and set it aside. I put wok grate in the bottom of the pot and hook my bag into the pot. I made the bag myself out of a voille fabric. Bag size is important, the pot should fit INSIDE the bag. I use office binder clips to hold the bag onto the pot. I can still put the cover on it then. I slowly pour the grains in and stir out all the dough balls. I pour the dissolved salt water in and stir again. I cover the pot then wrap it in an old comforter and set the timer for 90 minutes. I find 90 minute mashes give me good results. The first half hour or so I may stir the mash once or twice. With about 15 minutes left in the mash, I move the kettle off the burner and onto a side table. 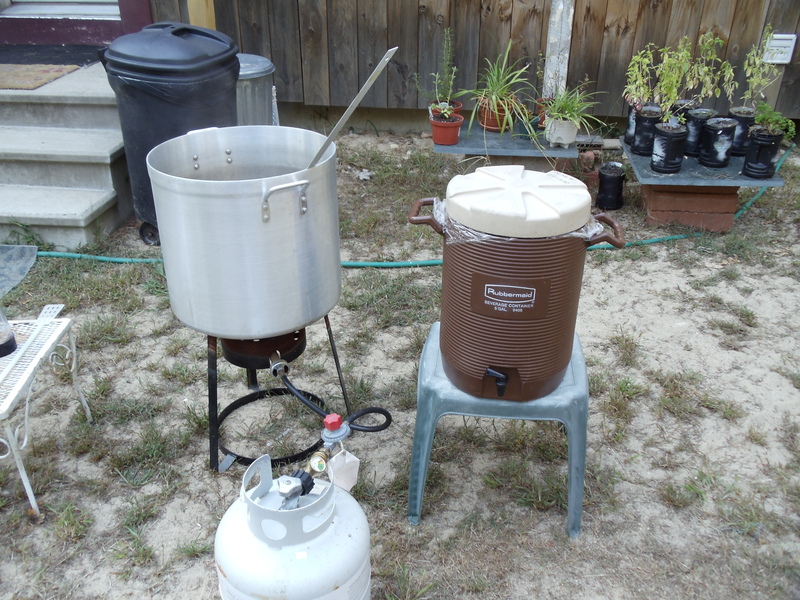 I use the pot that came from my turkey fryer with the 2 gallons of water that I set aside for a sparge and heat it up to 170F+. 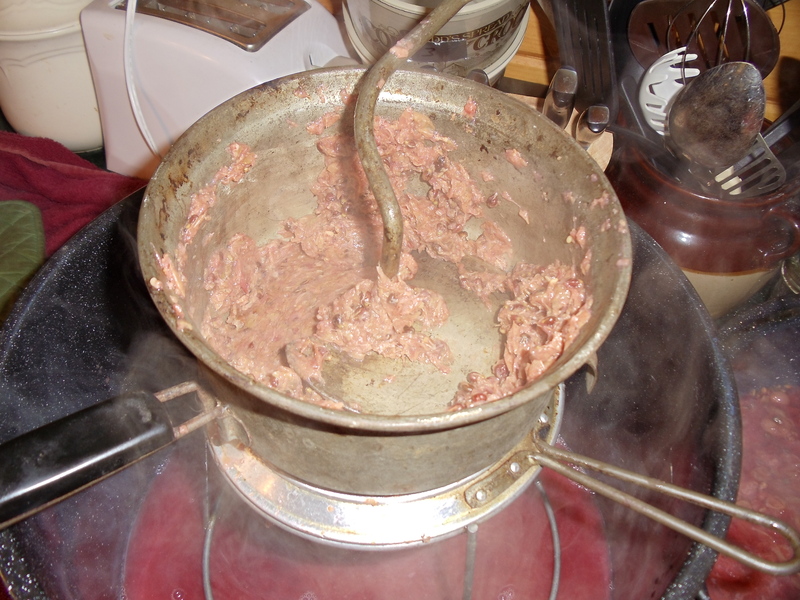 I set the pot on the ground next to the burner and reset the mash kettle onto the burner again. Once the mash time is up, I unwrap the kettle, remove the cover, and unclamp the bag. I gather up the ends of the bag and begin to lift it out of the mash water. No pulleys needed. I’ve handled a 23# mash before, it isn’t really too heavy. I begin to twist the bag to tighten around the grains and continue to hold it over the water. If I have a helper, I will have the burner on medium as I am draining. 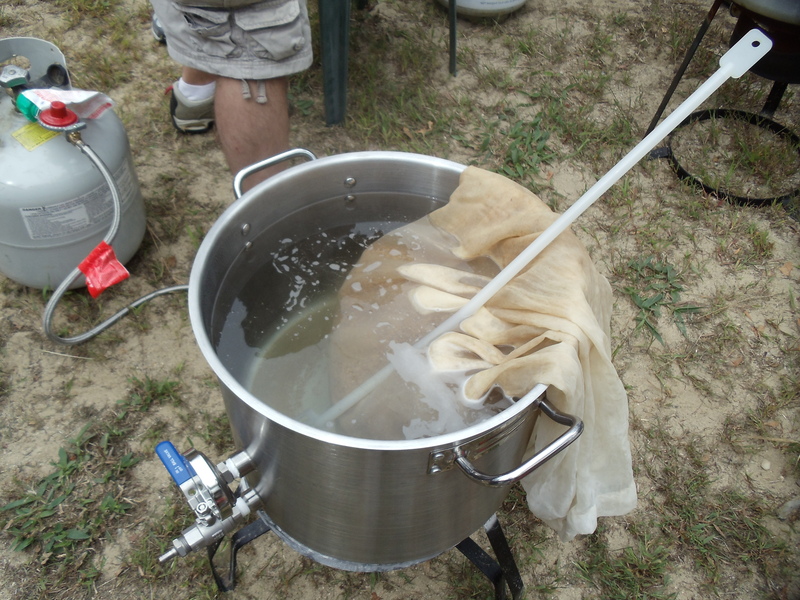 I keep twisting and holding until the stream is fairly low then quickly move the bag over to the sparge kettle. 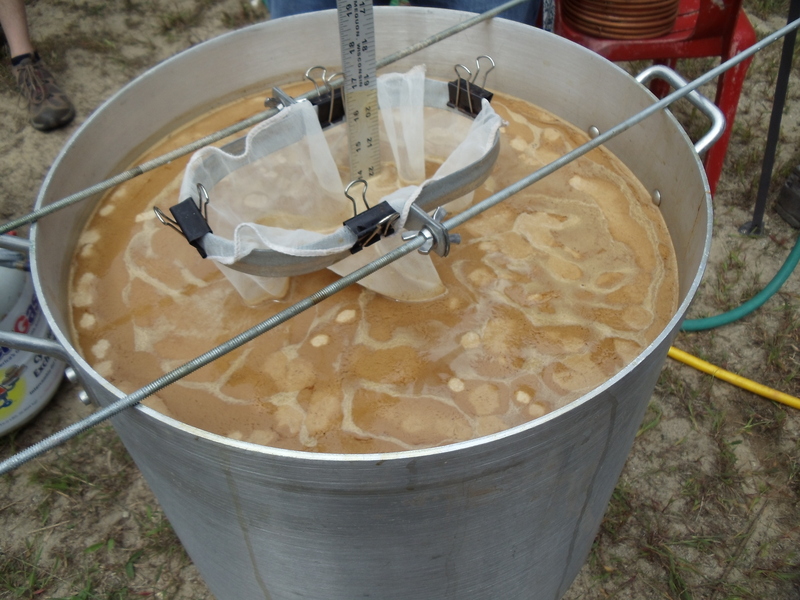 I dunk the bag in the sparge water a few times to make sure the hot water gets into the grain bed to knock the extra sugars out. I then do the twist and hold procedure again. I will then put the bag into one of my fermenter buckets and dump the sparge water into the boil kettle and fire the burner up to high. 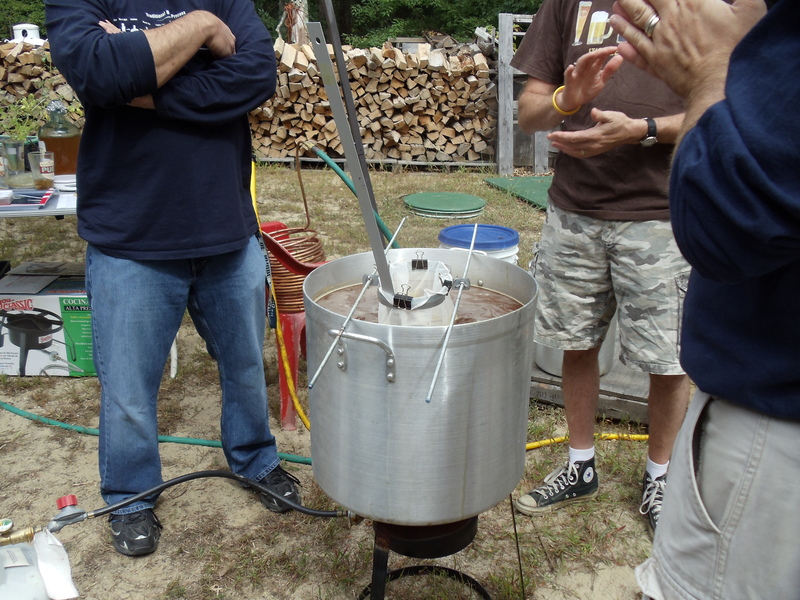 I put a metal colander upside down into the turkey fry pot and put the grain bag ontop of that. I use a metal pan cover to squish the bag against the colander and twist and squeeze and reposition the bag and repeat until I can’t get any more liquid out. That wort goes into the kettle too and the grain bag goes into a 5 gallon round cooler with the end open for my sour mash two days later. From this point on, the brew is like all other brews. I boil and add the hops at the required time. I chill. 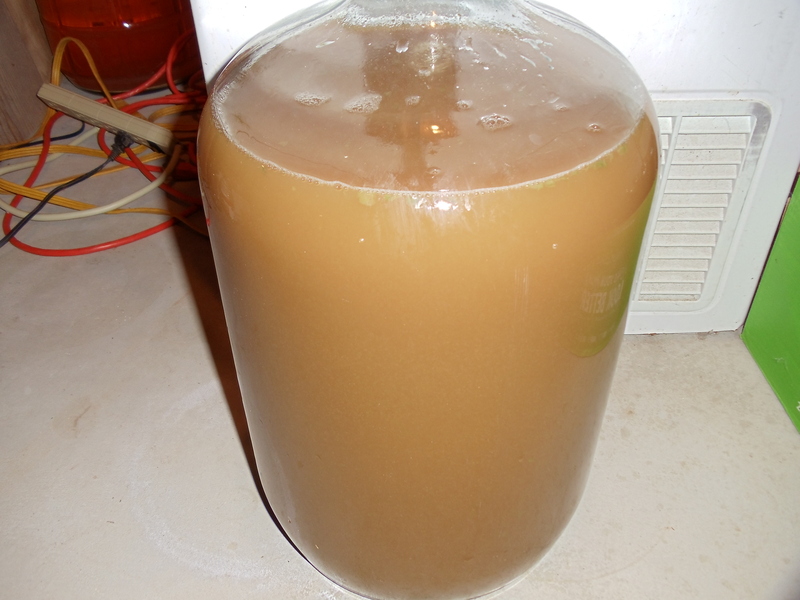 I transfer into my carboy, pitch the yeast, and ferment. The beauty of BIAB is it can be so simple, by not sparging, just use all your boil water in the mash. But it can also be used for advanced techniques like decotion. 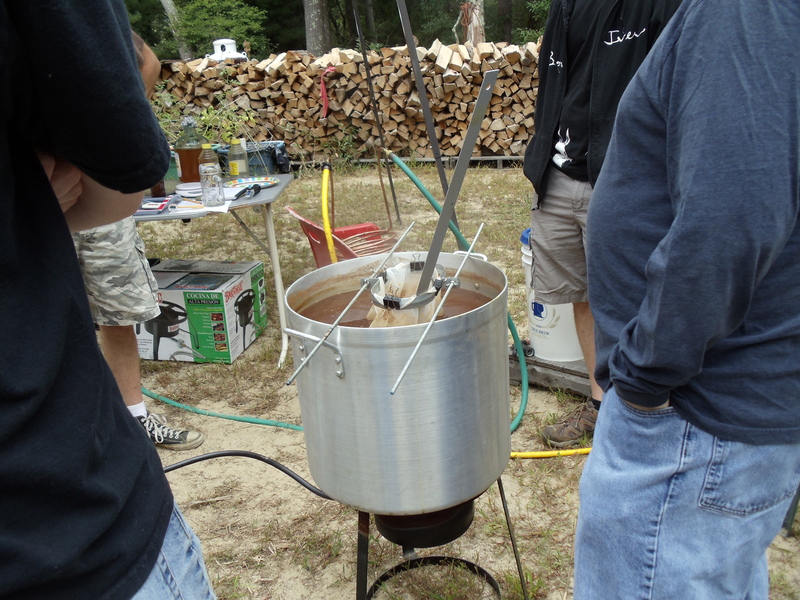 See, you have a fired mash tun so you can decoct or step mash with the full volume of water by just lighting the burner. You can partigyle. 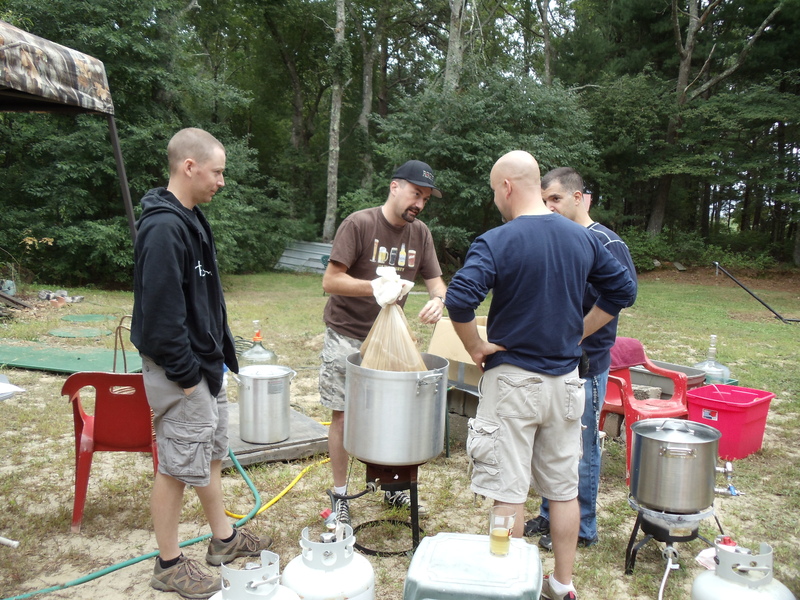 You can minimash a large batch of partial boil beer. BIAB is NOT a stepping stone to the cooler mash tuns. It is a legitimate alternative. 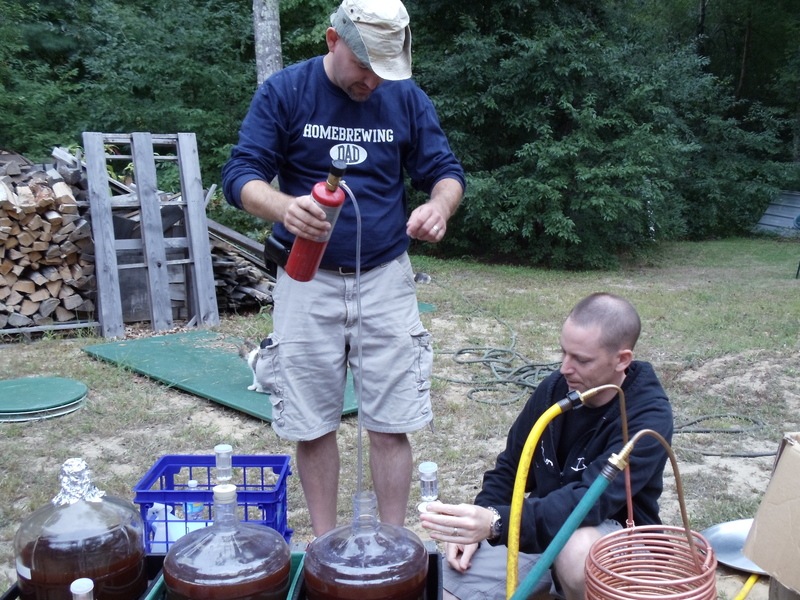 The quality of beer is equal to the traditional sparge methods. There is some time savings. There is significant equipment cost savings. There is significant equipment space savings. The calculations are pretty simple. The concept is easy to grasp. 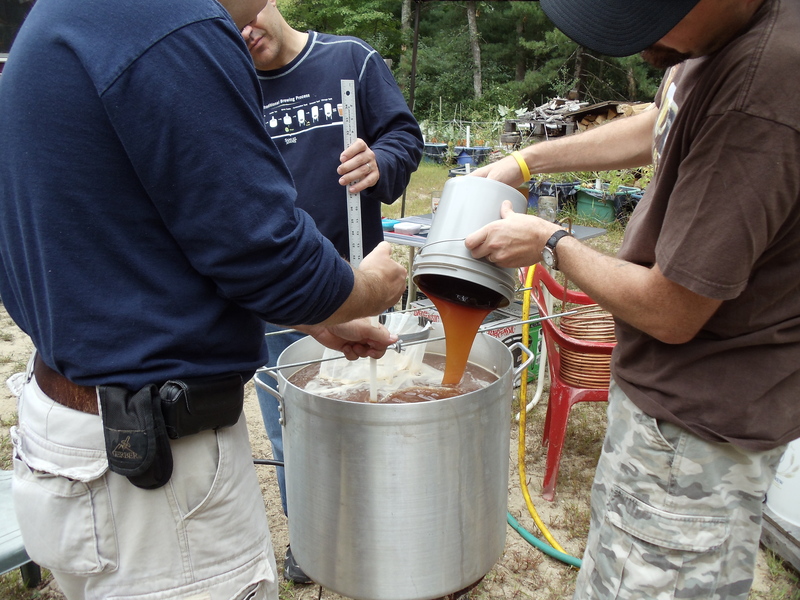 You can get a high quality wort with high efficiency. 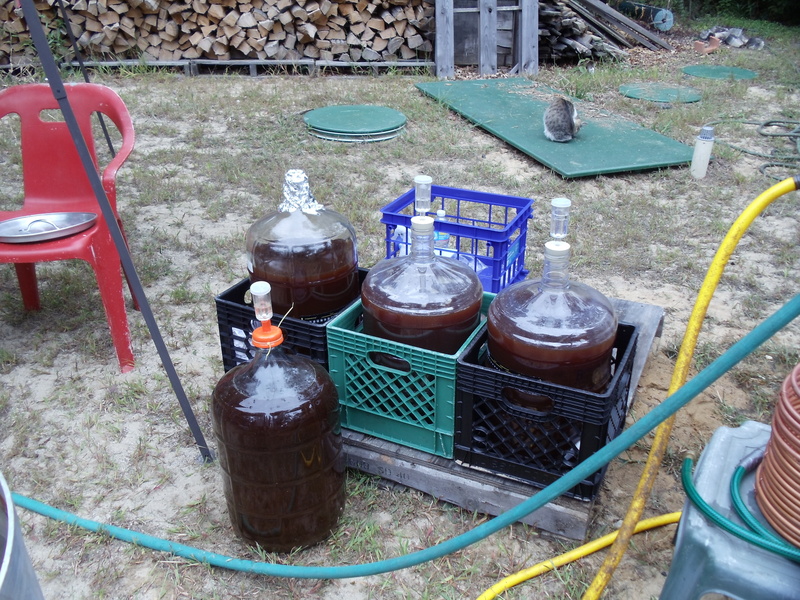 You can do large batches (I’ve done 11 gallon batches). 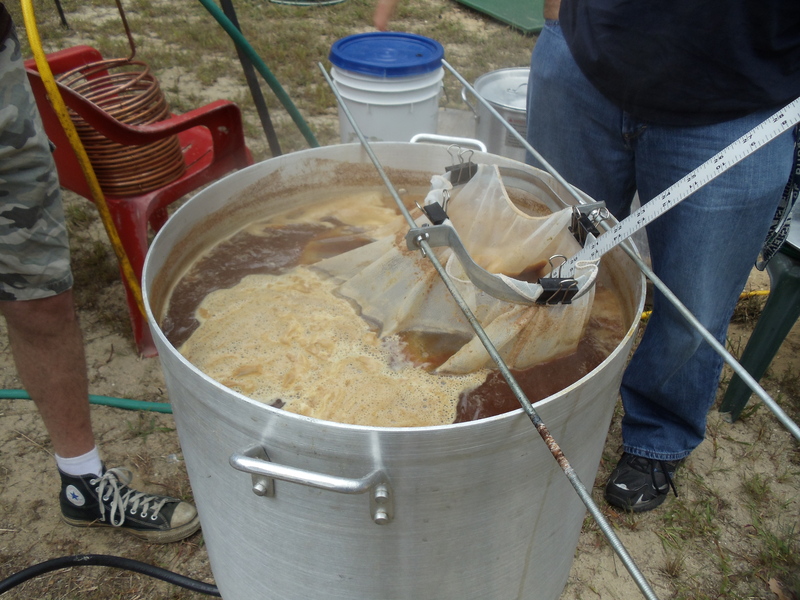 You can do high gravity (you have a 15 gallon mash tun as opposed to a 5-12 gallon cooler). No stuck sparges. No grainbed channeling problems. No astringency issues. 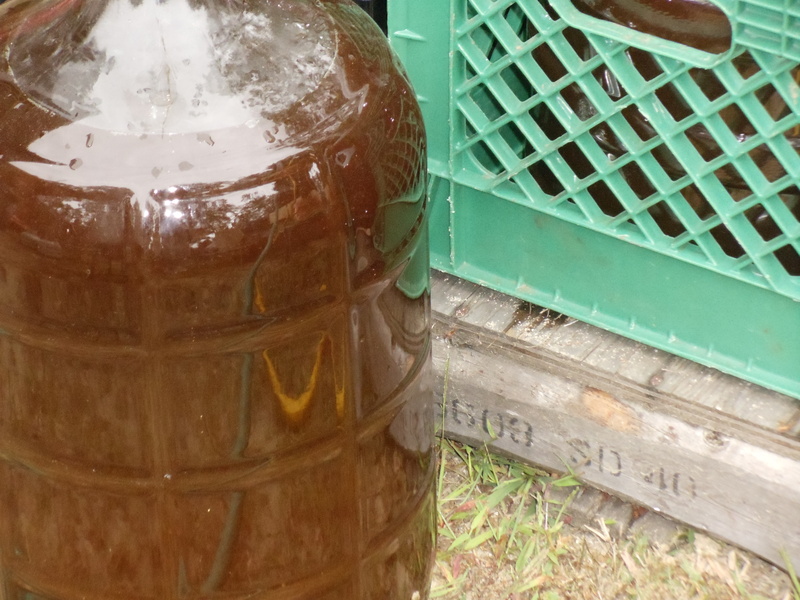 I heard there was a recent study that found the cloudy wort you get from BIAB is actually helpful to the yeast! 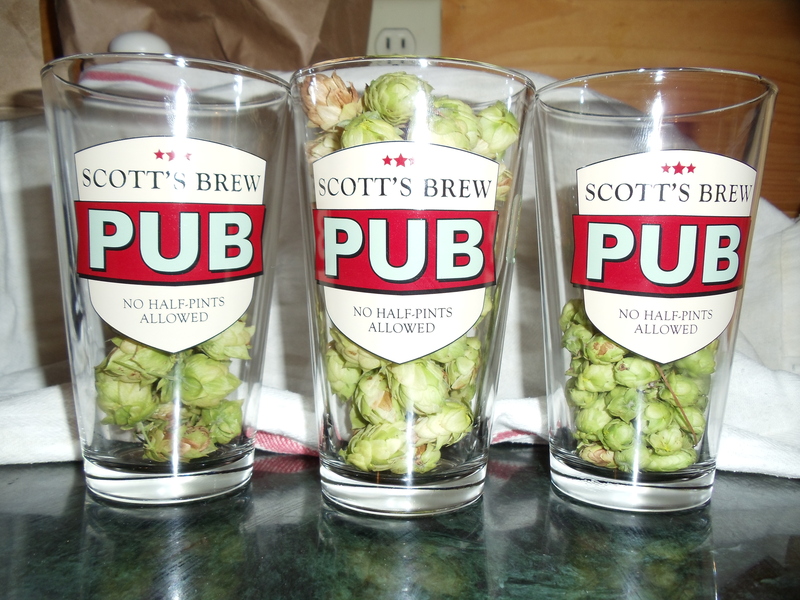 Yesterday I let the bines down and picked hops from three of the mounds. Again, with my fighting cancer this spring, they did not get the attention they should have so the crop is pretty low. Actually, to have gotten anything is a gift from Aegir. 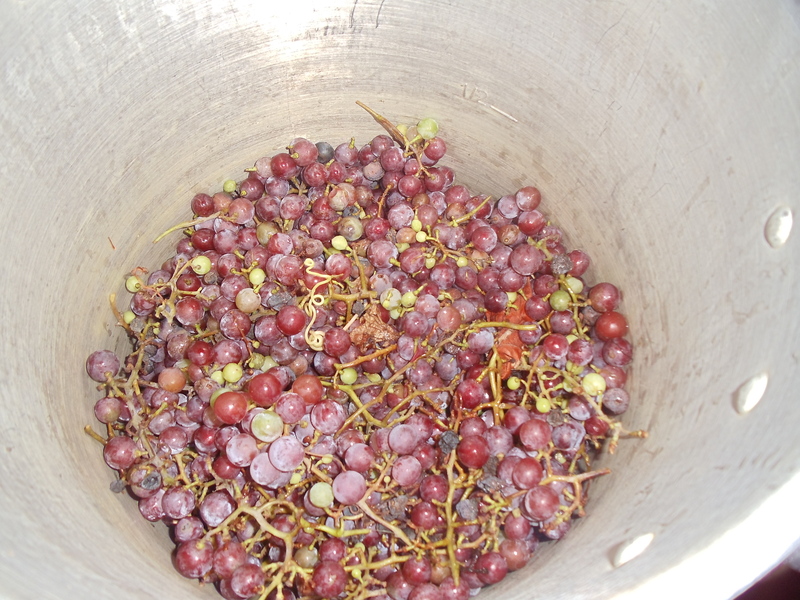 Niagara Grapes Harvest and Processing. 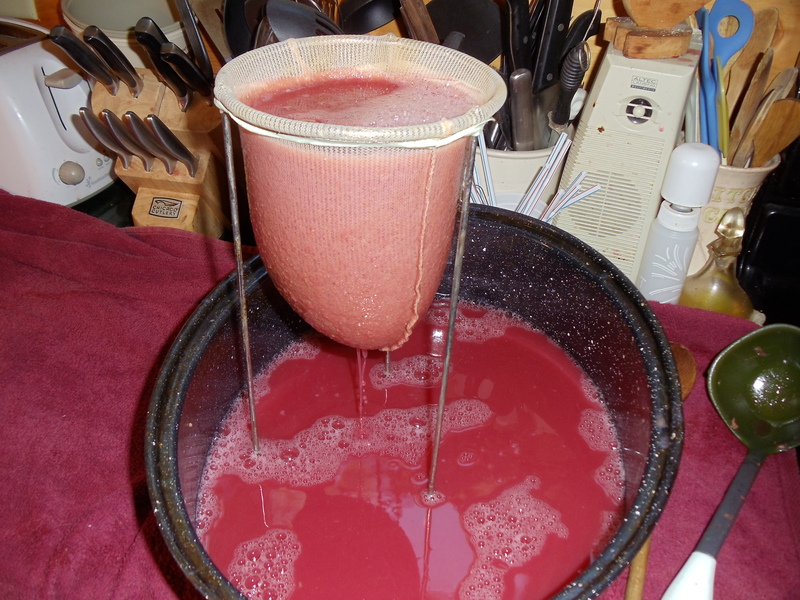 We harvested my parent’s Niagara grapes yesterday and made juice. 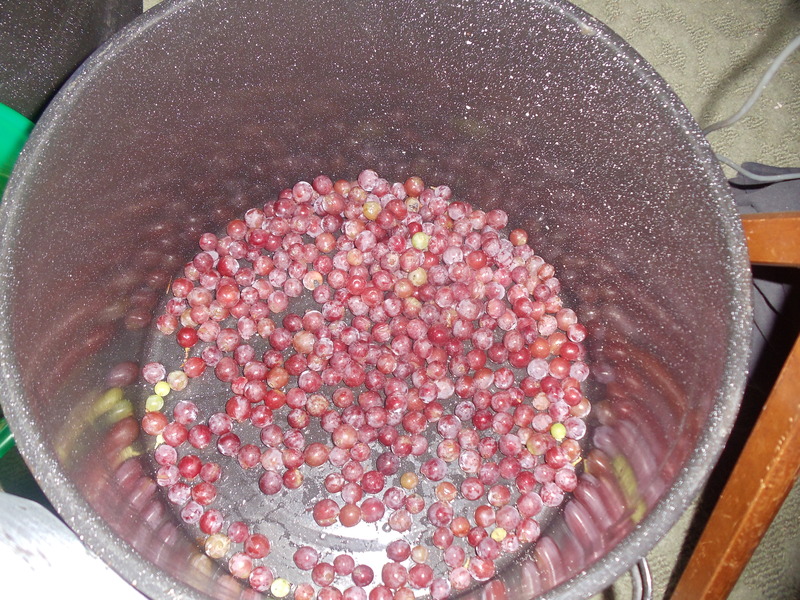 I picked the grapes and collected them in my turkey fryer pan. Then I separated the good fruits from the stems, leaves, and poor fruit. I took the fruit and squished them with my hands until I had burst all of them. I added some water and began boiling them for 1/2 hour, covered and on medium heat. 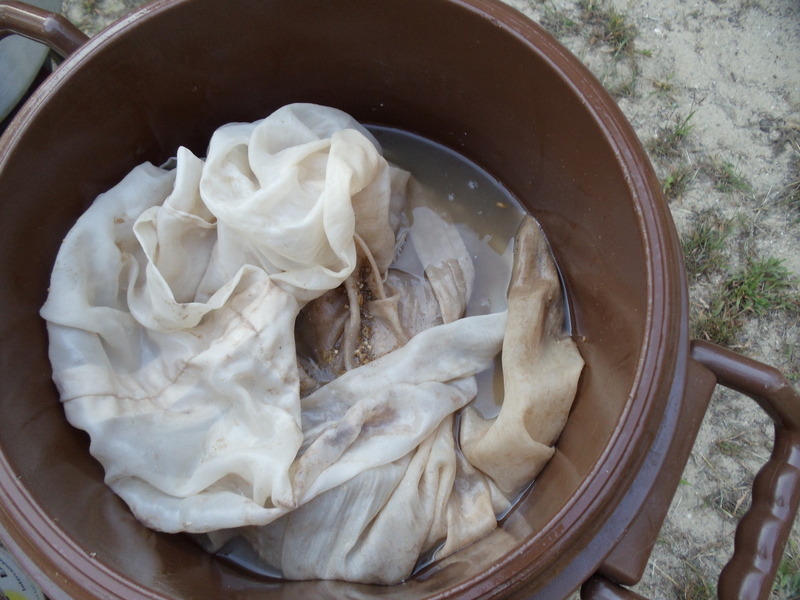 I put the mush through a sieve, emptied the leftover mush into a ricer run over the sieve, then the mush left in the ricer went into a strainerbag and squeezed all the liquid I could get out of it. 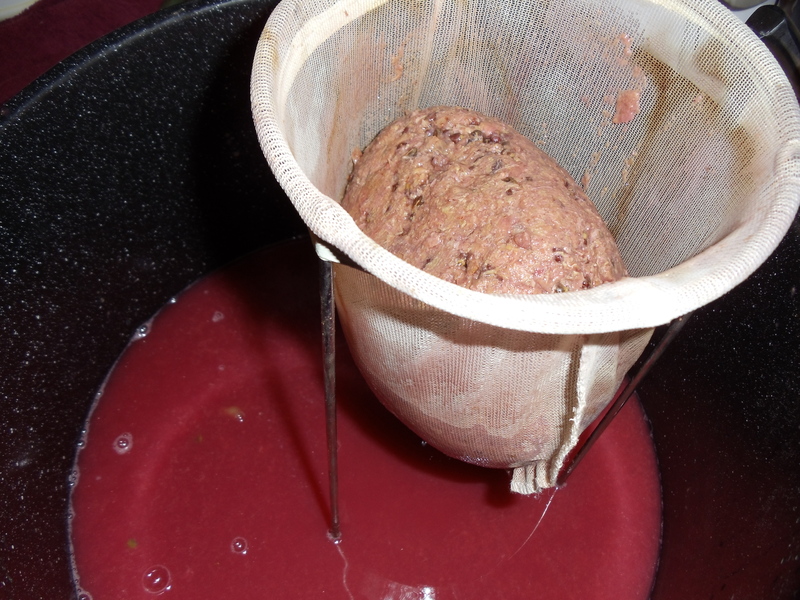 Then I poured the liquid through the strainer bag. 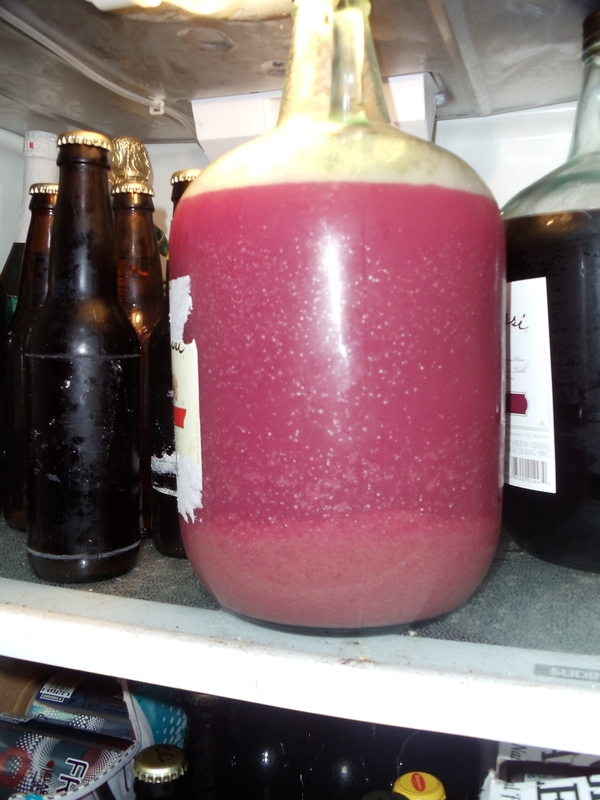 I put the juice in a gallon wine jug in the refrigerator to settle out. 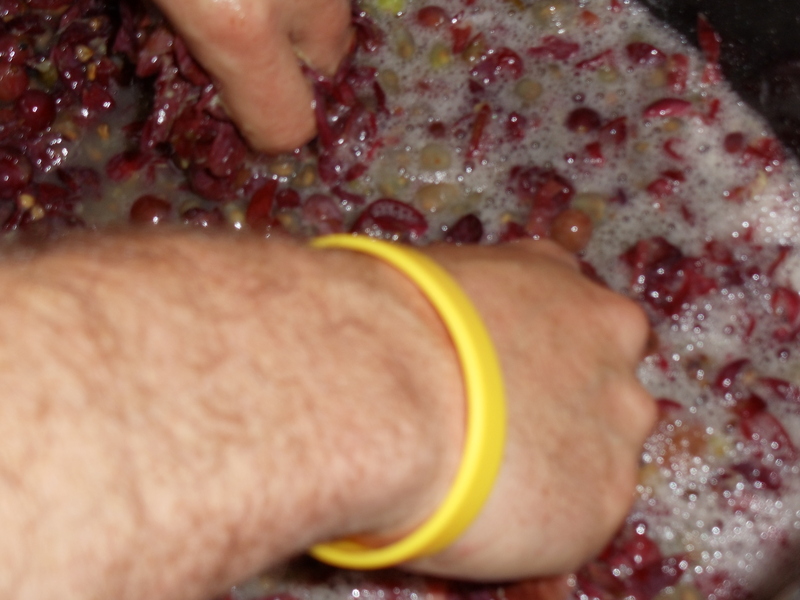 We’ll taste it when it settles out to see if it will become juice, jelly, wine, or pyment. The 48 mash on the right. Sparge water on the left. Time for another sour beer. This time I took the grains from our Holiday Spice Ale and soured them for ~48 hours. They were 4# aromatic and 4# honey malt. 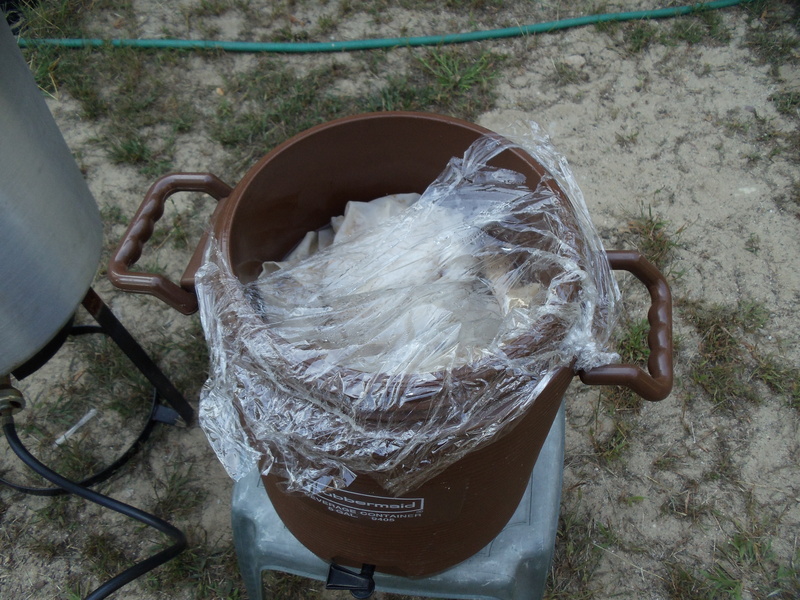 I pitched 2# Maris Otter and 2 oz Torrified Wheat into the bag, placed it in the cooler, then tossed 2 gallons fo 170F water. I covered it with Saran Wrap and screwed the lid on. It sat outside for around 48 hours. Too bad you can't smell the funk. Looks like a normal brew except the color. I got 1.039 OG from the cooler. I got 1.024 OG @ 4.5 gallons after the sparge. I shot for 1.022 OG @ 5 gallons final product so topped up to 7 gallons in my pot. 60 minute boil with 0.5 oz of Glacier Hops. Last 5 minutes got .25 oz each of Coriander and Grains of Paradise. Rehydrated Nottingham and basement temperatures without my usual swamp cooler, this is a sour after all. 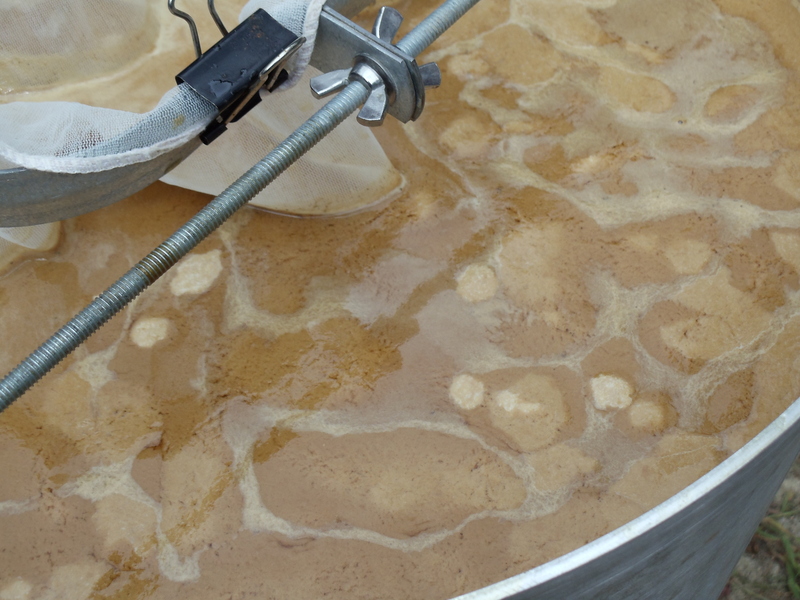 I may pitch some table sugar in there after high krausen, depending on the smell and what it looks like….ok, it will be on a whim if I do. Final OG reading into the fermenter: 1.023. 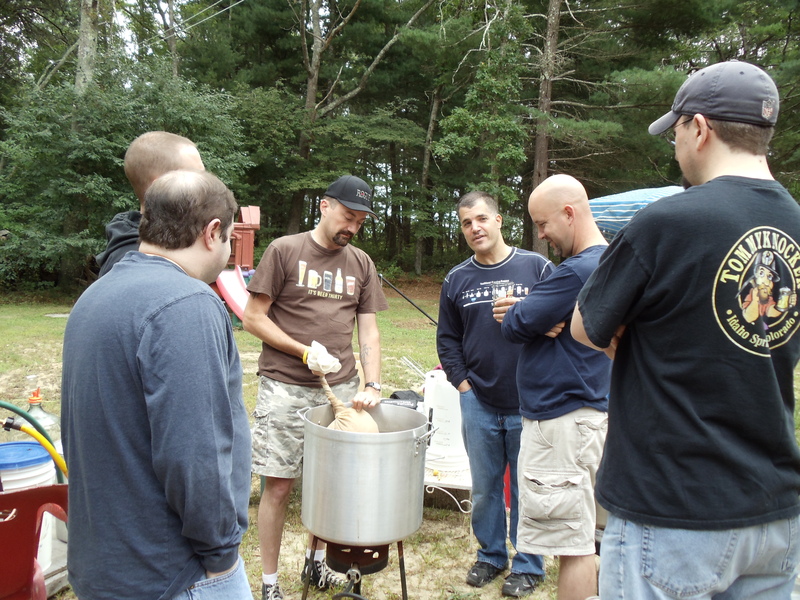 This past Sunday, the Southcoast Homebrewer’s Association got together to brew up a Holiday Spice Ale. 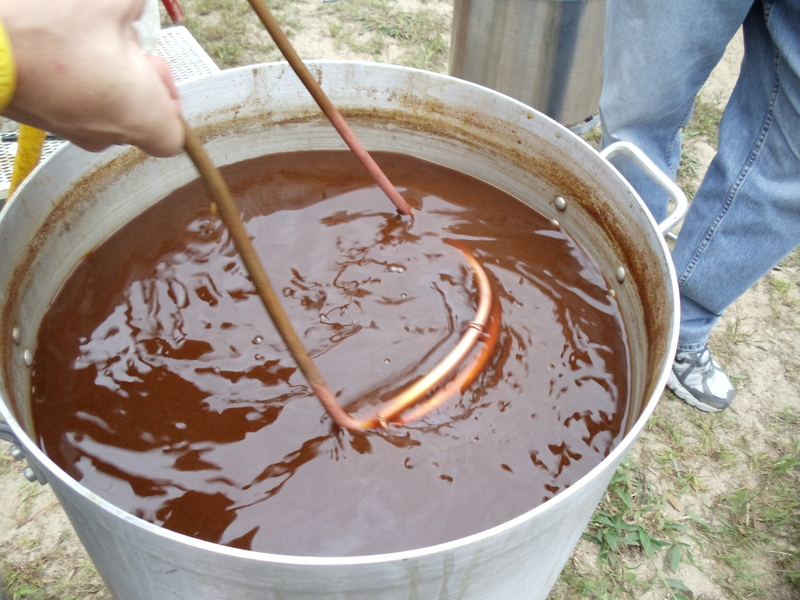 The wort smelled amazing! We had a great time as usual. Tasted some amazing beers. Jesse got beer of the day for his Golden Strong. Greg even joined us from Alaska via Skype. 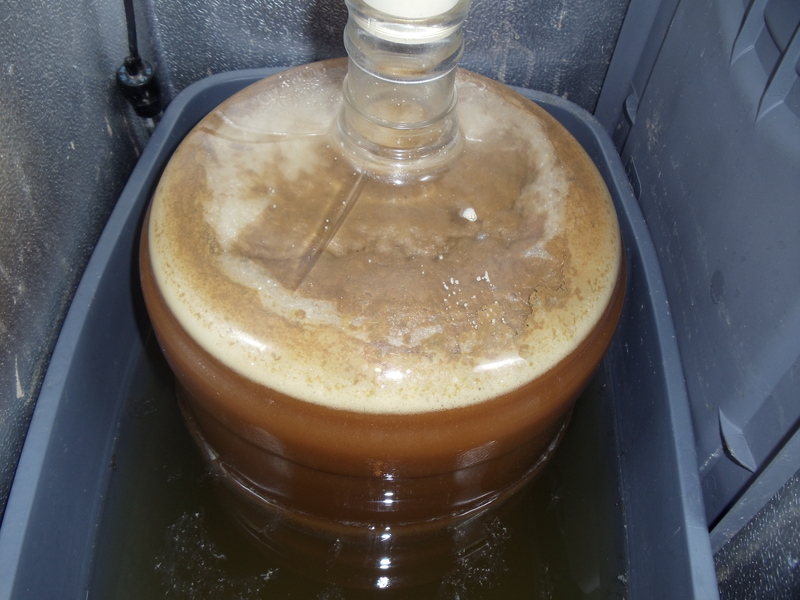 Fermentation kicked off sometime this morning on mine; I’ve got an airlock full of wort! Interesting start to the boil. Hops are in, boil going. Waiting for next hops addition. 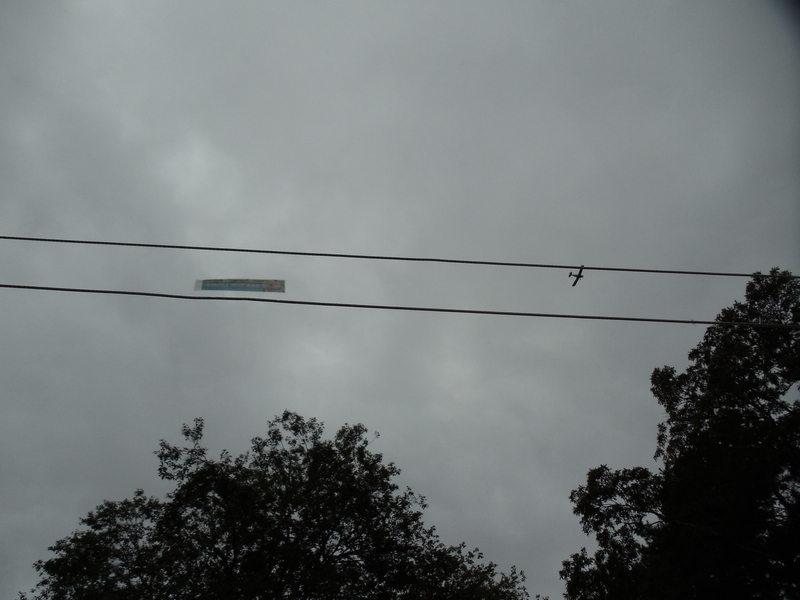 Buzzed by a plane toting a banner. 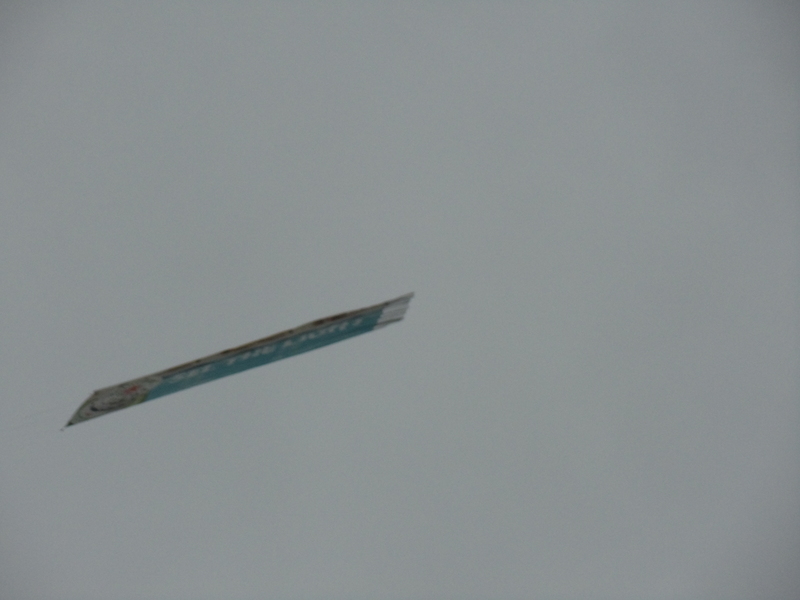 The sign says "See the Light" by Heineken. Sorry, the message couldn't have fallen on ears more deaf than at this HOMEBREW party. 20 gallons of wort waiting to become beer.